For many families the task of dealing with the physical assets of an estate auction is overwhelming. Discovering, identifying and marketing the items. How do you know where to begin! Set-up day 1 look at one of fourteen building at a Sparta, Michigan estate auction in 2014. The first order of business after the estate auction is decided upon and the paperwork is signed is to get the marketing underway. A properly advertised auction is a successful auction. Items are photographed and written down for use in marketing the estate auction. See our marketing page for a description of our methods. Sometimes it is necessary to improve the items of your estate to realize their potential, this may include cleaning them, assembling them or pulling them from deep in the weeds! Whatever the case, we work diligently to make your items marketable. Arranging items for sale at auction. Properly arranging items is an important part of the auction process. Well arranged and displayed items are easily to sell. Properly arranging items also speeds up the auction process and creates momentum. Typically items arranged in categories, ie; tools, glassware, furniture, etc. We provide the necessary tables and/or wagons to properly display your merchandise. In many cases items are arranged and boxed in groups to create value. 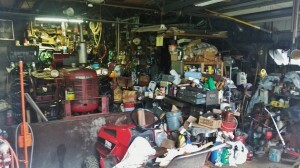 Good items surrounded by junk…look like junk. Under this pile of junk and random scraps of carpet is $22,000 worth of motorcycles. It may be necessary to dispose of unwanted or items of no value, sometimes just getting rid of the junk can improve your bottom line. 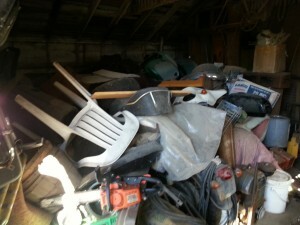 To dispose of items that are a liability we may burn them or rent a dumpster and just throw them away. In many cases your estate auction may have items that require some ‘assistance’ to move. Things like old cars, farm equipment any number of larger can be a problem to move or remove. We are fully equipped with equipment to get the job done. 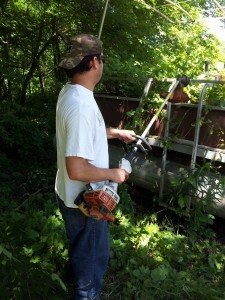 At our disposal are tractors, loaders and trailers that will get those items moved. 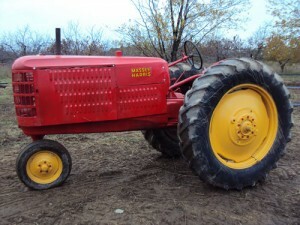 This Massey Harris 101 Super collector tractor was completely disassembled. 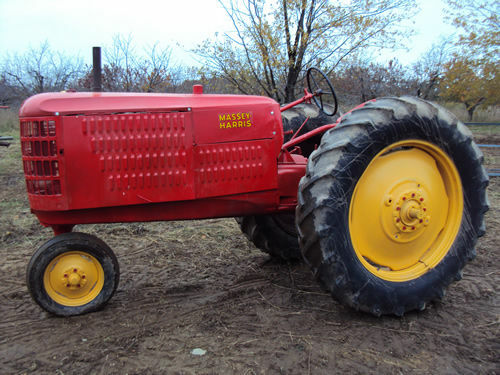 Our staff assembled the tractor to improve it’s value. 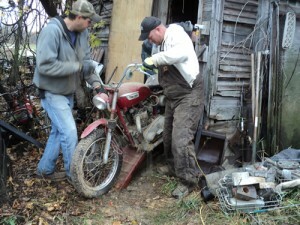 In many cases items such as tractors, cars, motorcycles or anything with an engine are more valuable when running. 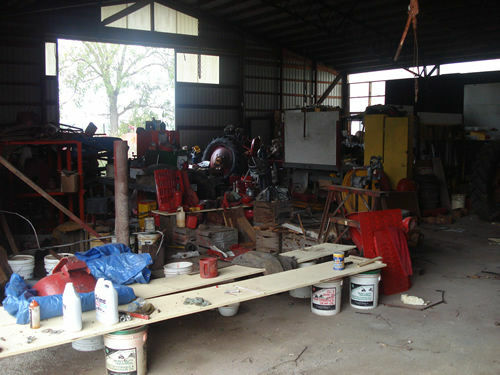 We have experience in fixing these items and have put many items back into shape for auction day. We assess the item, the problem with the item and what is necessary to fix it. If we believe returning an item to working condition is necessary to reach it’s full potential it will be discussed with our customer before moving forward. Real estate clean-up and maintenance. We want your property ready for show, see our property improvement page for more details. Getting your items ready for auction. Pulling a 1933 Model A from it's 50 year resting place! Signs and automobilia arranged neatly before the McGraw Tire auction in Grand Rapids, Michigan 2014. Example of small items set-up. 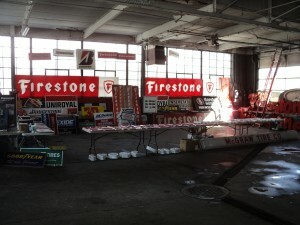 A tent full of boxed and organized items at the Lawrence B. Quirk Auction in Alto, Michigan 2015.